1 Whether arrears of Wages/Salaries w.e.f. 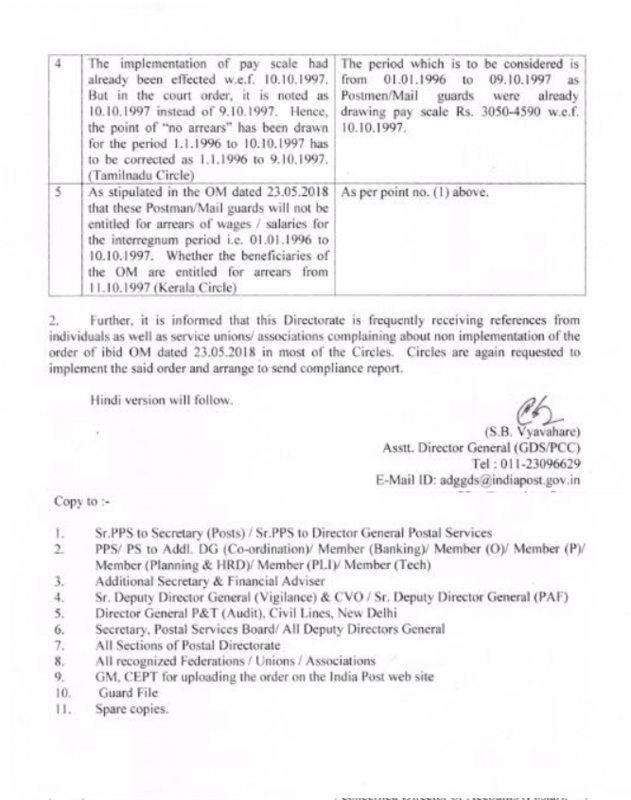 10.10.1997 to till date, if eligible is to be drawn and paid or not (Tamilnadu Circle) The DG Posts OM dated 23.05.2018 has inter alia mentioned that Postmen/Mail Guards will not be entitled for arrears of wages/salaries for the interregnum Period i.e, from 01.01.1996 to 10.10.1997. However, they have not been barred from arrears of wages/salaries for the rest period; in the Hon’ble Court’s judgment as well as DoP’s order dated 23.05.2018. 2 If it is only notional fixation of pay w.e.f. 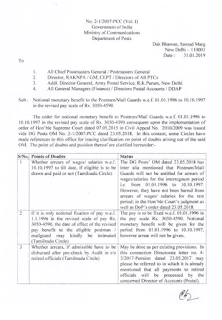 1.1.1996 in the revised scale of pay Rs.3050-4590, the date of effect of the revised pay benefit to the eligible postman/ mail guard may kindly be intimated (Tamilnadu Circle) The pay is to be fixed w.e.f. 01.01.1996 in the pay scale Rs. 3050-4590. Notional Monetary benefit will be given for the period from 01.01.1996 to 10.10.1997. however, arrear will not be given. 4 The implementation of pay scale had already been effected w.e.f. 10.10.1997. But in the court order, it is noted as 10.10.1997instead of 9.10.1997. Hence, the point of “no Arrears” has been drawn for the period 1.1.1996 to 10.10.1997 has to be corrected as 1.1.1996 to 9.10.1997 (Tamilnadu Circle) The period which is to be considered is from 01.01.1996 to 09.10.1997 as postmen/Mail guards were already drawing pay scale Rs.3050-4500 w.e.f. 10.10.1997. 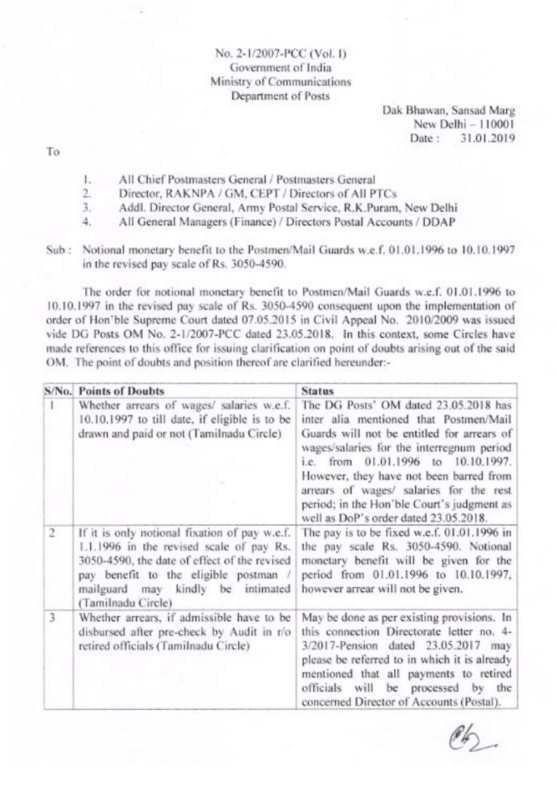 5 As stipulated in the OM dated 23.05.2018 that these postman/Mail guards will not be entitled for arrears of wages/salaries for the interregnum period i.e 01.01.1996 to 10.10.1997. Whether the beneficiaries of the OM are entitled for arrears of the OM are entitled for arrears from 11.10.1997 (kerala Circle) As per point no. (1) above. 2. Further, it is informed that this Directorate is frequently receiving references from individuals as well as service unions/associations complaining about non implementation of the order of ibid OM dated 23.05.2018 in most of the Circles. 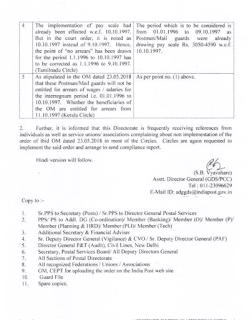 Circles are again requested to implement the said order and arrange to send compliance report.